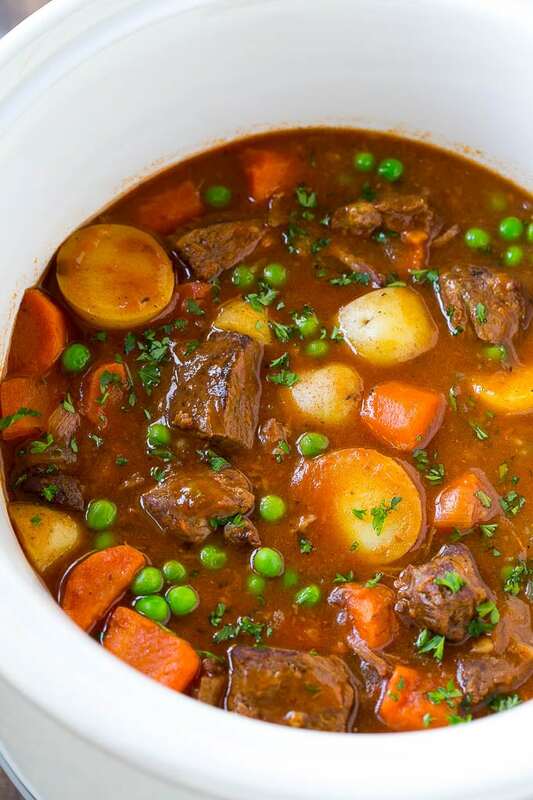 This slow cooker beef stew is loaded with chunks of tender beef, potatoes, carrots and peas. It’s a hearty and comforting one pot meal where the crock pot does all of the work! Beef stew is a comfort food classic that is universally adored. My slow cooker version means you can start it in the morning and come home at the end of the day with dinner waiting for you! Beef stew is one of my favorite dishes to make in the cold weather months, but let’s face it, sometimes it can be time consuming. In order for the beef to get fork tender, it needs a long and slow trip through the oven, which means you’re home all day waiting for it to cook. With this slow cooker beef stew, there’s no oven time required. You can set it in the morning, go about your day, then come home to a hot and savory meal. 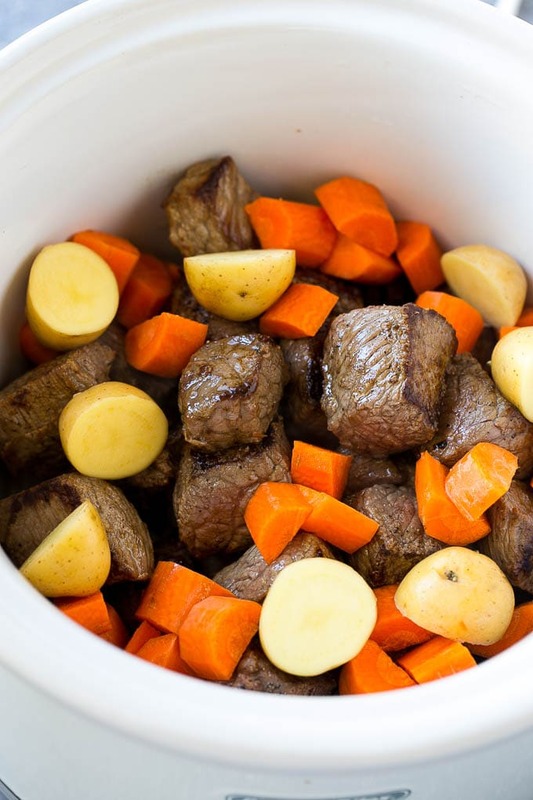 To make this dish, you’ll need beef stew meat, potatoes, carrots, onions, beef broth and seasonings. I do take the extra step of browning the beef before it goes into the crock pot, I think it adds SO much extra flavor. If you don’t have time in the morning to brown your meat, you can throw it into the slow cooker as is, and your stew will still be delicious. You’ll want to cut your veggies on the larger side, that way they won’t get mushy from cooking all day long. I use small yellow potatoes which I cut in half, but if you can’t find this variety, it’s fine to dice up a regular sized yellow potato, or substitute small red potatoes. I add the peas at the very end of the cooking process. You can simply add the frozen peas right before serving and they’ll thaw in the hot stew and be perfect! 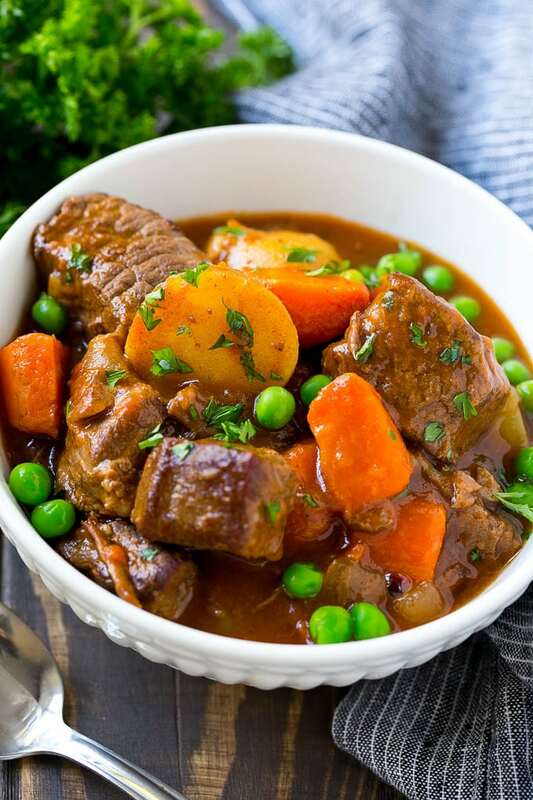 This slow cooker beef stew is a great candidate for a freezer meal. I often make a double batch, freeze half in a resealable bag, then thaw and heat on the stove. I typically serve my stew with a side of bread, but between the meat, potatoes and veggies, it’s really filling enough to serve as-is for a complete meal. Your whole family will love this dinner, and you’ll love how easy it is to make! 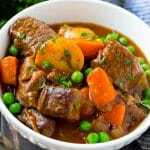 This slow cooker beef stew is loaded with chunks of tender beef, potatoes, carrots and peas. It's a hearty and comforting one pot meal where the crock pot does all of the work! Heat the olive oil in a large pan over medium high heat. Season the stew meat generously with salt and pepper. Cook the meat in a single layer for 4-5 minutes on each side or until golden brown. You may need to cook in batches. Place the meat in a slow cooker along with the onion, garlic, potatoes, carrots, beef broth, tomato paste, thyme and bay leaf. Add salt and pepper to taste. Cover and cook on LOW for 7 hours or HIGH for 4 hours. Remove 1/3 cup of stew liquid from the slow cooker. Add the flour and whisk until smooth. Pour the flour mixture back into the stew; stir to combine. Cover and cook on HIGH for an additional 30 minutes or until stew is slightly thickened. Uncover and stir in the frozen peas. Sprinkle with parsley and serve. Got leftover tomato paste? Place it in a plastic bag and freeze to use later in another recipe! Cubed beef chuck roast also works instead of stew meat. I don’t like stew but my husband does so I figured I’d make it and just let him have it. Goodness I am the one that ate the leftovers! I made exactly as recipe noted, no substitutes and it was yummy! I actually thought it got better each day I had it for lunch so making again this week! My picky two year old also loved! Thank you so much for this yummy sounding recipe. I’m making this as we speak and I can’t wait to have a taste. Really hoping my daughter will like it as well… picky eater! I’m using my Instant Pot as slow cooker. I will program my Instant Pot for SLOW COOKING (“venting”) in SLOW mode and for 7 HOURS. Will this work? 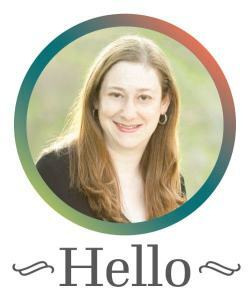 I saw that you are using the Instant Pot in other recipes and was hoping you could advice. I love to cook but this is a first for me in terms of slow cooking ;). So glad you enjoyed it, thank you for leaving a comment! Wow! I’ve tried slow-cooker beef stews before but this is the ONE. It’s so simple, warming and delicious. Do you cook the frozen peas before adding them? You don’t need to, they’ll cook in the stew! My family and I really enjoyed this recipe. As a person who is currently counting calories, I was wondering if there was a specific measure of stew that equaled the 426 calories. Since you said it made 6 servings is it just 1/6 serving for that calorie amount? It’s 1/6 of the recipe which should work out to around 1 1/2 cups! I am making this right now. I also added 1/2 cup of red wine. I sounds delicious. Also, when I have leftover tomato paste (I buy large cans), I freeze it in regular sized ice cube trays. One cube is about 3 tablespoons. After it’s frozen, I pop them into a freezer bag and I always have the right amount. Great idea! Hope you enjoy! I do this, too. I got tired of using only 1 or 2 tablespoons of tomato paste and throwing the rest away! Wasteful! Yay, so glad to hear you enjoyed it! I making this recipe today. I read that people used 1 cup of red wine. Is that red wine vinegar or just red wine? It would be red wine! It was a hit. I followed the recipe except for substituting (as some others did) a half cup of red wine for some of the broth. Will make this again. Holy smokes! I have never cared for stew, but I needed something that could come together quickly and cook while at work. I didn’t have tomato paste, beef stock, or dry thyme, so I used pureed fresh tomato, veggie bouillon, and a couple sprigs of fresh tarragon. So good I had seconds! Excellent, i’ll Be making this stew again. I made only two small changes. One was in adding I cup of red wine in place of one cup of beef broth as my husband likes that flavor and aroma as its cooking. I also substituted Parsnips for the potatoes. Love the idea of using red wine and parsnips, glad you enjoyed it! The recipe was amazing. Added a bit more carrots and broth. Also, used the Better than Bouillon Beef Base – Reduced Sodium. Beef came out so tender which was amazing considering the beef can become to tough in a crockpot. Thanks so much for posting! So happy to hear you enjoyed it! Thanks for reporting back! This was very good! I made this in my Ninja Foodi using the slow cooker option and this came out excellent. The vegetables were not mushy and the meat was very tender. We will be making this again. Thank you for sharing. So happy to hear you enjoyed the stew! Thanks for reporting back! How long will this last in the fridge? Freezer? It keeps in the fridge for up to 4 days and in the freezer for 2 months! Yay so happy to hear you liked it! Thanks for reporting back. You mentioned doubling for freezing. I would like to increase quantity of beef to 4 lbs as I have to feed a family Christmas dinner. I ‘d probably not double potatoes as only my husband likes them. Should it come out well in 6 qt cooker? Thank you for great recipe. If you’re using 4 lbs of beef, I’d recommend changing the number of servings in the recipe card from 6 to 9, it’ll automatically calculate the correct amount of ingredients to scale the recipe up. You may want to use a bit less broth if you’re not using more potatoes. I hope this helps! grocery store. It took longer than 4 hours on high. More like 5.